Don’t ride MEX 1, ride the Baja Divide. Lael descends toward Ejido Uruapan on her Advocate Cycles Hayduke. It’s called the Baja Divide. The route touches the Pacific Coast and the Sea of Cortez multiple times. It crosses every mountain range in Baja California, a desert where freshwater streams and springs are not uncommon in winter, and where traditional ranching and fishing lifestyles persist. The route climbs and descends on well traveled graded dirt roads, popular 4×4 and moto routes, and forgotten jeep tracks. We’re planning a connection across Bahia Concepcion by panga, the durable fiberglass fishing boats used by local fishermen, to access a little used dirt road on the other side of the bay. The Baja Divide is a personal project of Nicholas Carman and Lael Wilcox to give back to the bikepacking community. We’ve enjoyed routes in Israel, Arizona, South Africa, Slovakia, Montenegro, and elsewhere. The Baja Divide is a dirt bikepacking route from Tecate to the southern cape. When the route is complete, it is expected to be nearly 2000 miles long and over 90% unpaved, recommended for bicycles with 2.3” tires or larger. Thus far, 3.0” tires as on Lael’s Advocate Hayduke have proven to be perfect for the route, and 4.0” tires would not be out of place. As always, pack light, leave room for food and water, and leave most of your cold weather gear at home. The route would be best enjoyed between November and February, when most dirt routes in the USA, Canada, and Europe are closed for the season. What began as a personal project to craft a pleasant ride down the peninsula– an experience and a route which we hoped to casually share— has developed into a commitment to publish a real route in Baja. As such, a real route is thoroughly researched, tested, and recorded. A GPX track, route narratives, and a resupply guide will be prepared. Most of all, I hope to be able to publish a printed resource similar to the high quality maps we have come to appreciate from the Adventure Cycling Association. There is much work remaining to complete the route. Thus far Lael and I have connected San Diego to La Paz by a series of dirt routes, and we plan a few more weeks of exploration in the southern cape with a rotating cast of friends who have joined us to escape winter and help with the route. Thereafter, Lael and I plan to take a bus back north to Tijuana to ride down the peninsula a second time. We will ride alternate routes, make detailed notes and waypoints regarding resupply, and record more GPX tracks from which the final route will be compiled. It is a big project, seemingly growing in scope every day. The future of the Baja Divide requires your support. We are looking for corporate and individual sponsors who wish to promote the project and the culture of self-supported bikepacking through financial or technical assistance. In-kind equipment sponsors are also welcome to offset costs associated with building the route, including worn tires and drivetrain parts, camping equipment, etc. For instance, Lael and I are both using threadbare sleeping bags, worn from nearly four years on the road. Additionally, I am looking for a high-quality 27.5+ wheelset for my Meriwether, as I’ve been jealous of Lael’s 3.0” tires on the many sandy and rough jeep tracks in Baja. My six year old Brooks B17 saddle has bent rails and has lost two rivets. We are also seeking assistance in building a high-quality custom website for the project. For now, I have built a simple WordPress.com site for the project at www.bajadivide.com. I expect to have a complete GPX track available later this spring. An informal group ride is scheduled to start on January 2, 2017. Lael and I will be there. Ride self-supported at your own pace, form your own groups, ride as much of the route as you want. I will begin sharing stories on the blog from the process of route building in Baja in the coming weeks. Look for more stories on Lael’s Globe of Adventure, the new Baja Divide website, and our new Instagram accounts @nicholascarman and @laelwilcox. This is the second part of our ride across Lesotho, following the Dragon’s Spine Route as described by the GPS tracks downloaded from the Dragon Trax website. Check out the first few days of our ride from the border of South Africa at Tele Bridge to Semonkong, Lesotho. On the morning of our ninth day in the country, as we crest the border to Monantsa Pass and ride back into South Africa, I am relieved to be leaving Lesotho. But Lesotho ranks next to Albania and Arizona and Alaska as one of the most unforgettable places we’ve ridden. It has been a bewildering and beautiful week, with the most challenging riding of the summer, now the first week in December. We are inspired to see people living their lives close to the land and traveling by foot, towing 50kg sacks of maize atop surefooted donkeys over great distances, because secretly, we despise cars as much as young Albanian men aspire to own them. But the ubiquity of certain insistant exclamations and queries from the roadside– such as “Where to? !” and “Give me the sweets!”– is tiring, overwhelming, and finally disappointing. While living outdoors and traveling at a human pace in Lesotho, on foot or by bicycle, you’ll never not be near people. And when Lael and I finally find a quiet place away from any roads, houses, maize fields, trash, or donkey tracks, a shepherd comes down the mountain to stand close and watch us. A little disappointed, as my energy for this kind of thing has waned in the past week, I manage to smile and say hello. Completely encased within the border of South Africa, the tiny Mountain Kingdom of Lesotho is a world away from its geographic guardian. Lesotho is lively and exciting, with a unique history that defines a population with more hope and happiness than its neighbor, despite greater poverty on paper. But wealth (or poverty) as described by per capita annual earnings in South Africa and Lesotho does not tell the whole story, not only because Lesotho is far less expensive than South Africa, but because a majority of the Basotho live in rural villages tending to their families and communities, producing food, keeping animals, building homes, and not earning or requiring much money for petrol, electricity, DSTV, or even cold beer. Whereas, many poor South Africans are forced to leave their families for much of the year to work on distant farms or in distant mines, factories, or the homes of wealthy white families to earn money. In South Africa, people live in villages and townships, structured community spaces arranged near shops and schools and other places that cost money. Conversely, the mountainous countryside of Lesotho is blanketed by people and maize, with many small villages of loosely organized homes naturally scattered along a hillside, the land considered a community resource of the Basotho people held in trust by the king. Despite the world’s third highest rate of HIV/AIDS and barefoot children with tattered pants running through the hills, Lesotho seems like a happy place. People are proud to live here. Children smartly inform us, “maize is our staple food” (although nobody in southern Africa seems to realize that maize was at once imported from Mesoamerica to this continent by Europeans, a fact I recall from grade school). Much of the black population of South Africa has been broken by Apartheid– no wonder the people are frequently charged with being unmotivated, uneducated, and unhappy. Lesotho is much, much different. As much as I was eventually ready to leave the country, crossing into Lesotho is a breath of fresh air. Aside from the inevitable challenges and awakenings of travel in a foreign land, the riding in Lesotho is epic. The geography of the country is hard to grasp at first– aside from being extraordinarily mountainous. A limited pattern of tar roads and decent quality gravel roads cross the connect the country and feed the growing demand for faraway goods, all of which come through the capital city of Maseru. In much of the rest of the country, famously bad roads, footpaths, and animal trails connect everything. Our less than obvious route across Lesotho crosses deep river valleys and high passes, and we touch our tires to tar only four or five times in about seven days of riding. If looking for a memorable route across the country, the Dragon’s Spine Route delivers, but it is challenging. There are more than a few other ways to plan routes through Lesotho. Exit or entrance via the infamous Sani Pass is recommended by Logan at Pedaling Nowhere. The riders at Lesotho Sky may be able to provide detailed information about off-road routes and more conventional gravel roads and tar. In addition to a mostly complete, but discontinuous GPS track across the country, I relied heavily on both the Tracks4Africa basemaps and the OpenMTBmaps. Both are recommended when traveling off the beaten path in South Africa and Lesotho, as each provides a unique yet incomplete vantage. The tar roads are largely free of traffic, except near Maseru. Leaving Semonkong with a load of food for two days, and the sense that something unique lay ahead. Our GPS track ventures into roadless terrain, and without topographic detail, I can only guess what lay ahead. There is a river crossing, some GPS waypoints indicating “steep” sections of 4×4 tracks, and other fragments of information that incite some caution (and excitement). A nice evening for a ride, and a very nice road. These woman stop us with cheers and jeers, insisting that we try their maize beer. And when the 2L Coke bottle empties, the big blue jug appears to refill it. At dark, we ask to put our tent near this village, a practice we’ve developed to limit curiosity in our presence and avoid alarm. Thankfully, the man constructing the structure near our tent is from Maseru, speaks English, and generally understands and appreciates what we are doing, avoiding the usual confusion and excitement of our arrival. This also ensures a little privacy as well, although we do have two visitors while we set-up the tent and unpack. By zipping ourselves into our nylon cocoon, the girls eventually get bored and wander off. The World Food Programme is responsible for administering many programs in Lesotho. This building will be a kitchen for the school. Our audience, who we regrettably shut out after we unpack our things. Tired from riding all day, we are most tired from being around people all the time. Nearing the hottest part of the year, Lesotho is just right in summer. The sun is still intense, but the days are nice and the nights are cool. Most of the country is above 5000ft. In the evening, we’d turned off the main dirt road onto a steep track. The only discernible tracks end at the village where we camped. Beyond that, it is all donkey tracks and foot paths along an old road bed. A chasm lie ahead– that must be the Senqunyane River. We descend all the way down to river level on a technical track, presumably once passable by 4×4 and probably not impossible to drive in most places, but there is no sign it has been driven in decades. Views, and a technical ridable descent to an eventual swimming spot. Nothing not to like. Sheep traverse the mountainside above, on what appears to be a good trail. A little steep for loaded hardtails. Rather, a little too steep for kids without health insurance many hours from whatever or whomever would help if we needed it. The concept of self-preservation is present in our minds while traveling rough and remote tracks. The newer bridge replaces an often dangerous ford, still required for the cattle. Immediately, the track ascends the other side. It rises more steeply than we descended, I think. Soon, there are children keeping pace with our hike up the mountain. This total ascent is about 2500ft, although more elevation is gained later. A lot of the ascent is unreadable, but a pleasant enough place to push a bike. Along the way, a growing group of children take chase. One particularly confident girls insists questioningly, “You are lost!?”. “No, I am not lost”, I inform her. She insists, again and again. “Fada, you are lost.” Many of these children call us father and mother. Not sure if this is a typical sign of respect, or something related to the history of Christian missionaries in Lesotho. After the usual introductions in which kids demand sweets and I laugh at them– asking instead if they would respond to my enthusiastic greeting– we break for some photos. Kids love to see the images. I think it is a reasonable way to exchange a few moments together, and to forget the sweets. It is not uncommon to be asked for sweets again as I take my first few pedal strokes away. I laugh again, half-heartedly. Bye! More than “Hi” or “Hello”, people love to say say “Bye” or “Bye Bye” in Lesotho, often used as a greeting as well in more rural places. In order of frequency we hear the phrases “Give me sweets”, “Where to?”, “Bye bye”, and “Good morning”. Morning lasts all day. We eventually crest the ridge to discover a deep river valley on the other side as well. We continue along the ridge, continuing to gain some elevation. We take cover for a few moments as the wind blows and some water falls from the sky, thinking something really severe will develop. Everyone else seems to know that the storm will not materialize, but they offer us a roof for some time. The eldest daughter in the red and white robe is preparing to become a sister in Roma, a small city nearer to Maseru. “Me too!” Lesotho is an aspiring photographer’s dream. Maize for miles, all planted and harvested by hand, ploughed by animal, and most often transported by donkey to town for milling, and again by donkey on the return trip. A 3-string gas can banjo. Christianity is widely present in Lesotho. Our bag of beets reminds us. As we near Mantsunyane and a motorable road, outhouses, green plastic Jojo water tanks, and corrugated metal re-enter the landscape. There are always shortcuts for animals and people on foot. Finally, after a full day or riding and pushing, we are within sight of Mantsonyane. The nuns that teach at the large school here are all waiting for rides home, this being a Friday several weeks before Christmas. A quick resupply in town, including apples, onion, cold beers. And of course, repackaged off-brand Nik Naks. Originally sold in 5 or 10kg tubes (usually almost 2m long), this seasoned puffed maize is redistributed into small bags and sold for 1 rand or 1 maluti, equal to about $0.10. These smaller bags were only a half maluti, so I bought six. We follow the tar from Mantsonyane to Thaba-Tseka fro about 30 miles, over a high pass. The road is nearly empty, save for a few donkeys and white government vehicles. From the roadside we are invited to camp in a village and are led to meet the chief, a woman. Complete with crash test dummy. Camping adjacent to the chief’s house, the crowd of curious children keep their distance, for which we are thankful. After we have zipped our tent closed for the evening, for privacy, two small girls come by and are quietly felt nearby, whispering. Lael unzips and pokes her head out. They politely inform us, “We are here for the sweets.” Lael informs them that we don’t have any, and apologizes, not that we are sorry. We’ve been asked for sweets in many ways but I’ll never forget the phrasing, “We are here for the sweets.” Priceless. We awake to the chief sorting her maize at sunrise, tossing pebbles and ill-conceived kernels by the wayside. She then instructs this boy to stitch the bag back together. This shepherd has bought two fresh rolls from the shop for us. Bread is a delicacy for those that rely on maize. This village is much different that many of the places we’ve been in the last few days, as it is bisected by one of the only tar roads in the country. We climb the Pass of Jackals toward Thaba-Tseka and turn towards the infamous Khatse Dam. South Africans are especially proud of this massive civil works project, which provides power for Lesotho and water for South Africa. The project forcibly relocated many people, who ironically live without electricity. The tar road brings us to our highest elevation in the country, over 9500ft. This is the first time we have been able to look out without seeing signs of people everywhere. Not that two shepherds didn’t find us in the twenty minutes we rest by the roadside. We offer some of our tea and scones, which they are obliged to accept. No people, for the first time. The dirt road towards the Khatse Dam is well-traveled and in very nice condition. I exercise some tactics to avoid being asked for sweets, proactively greeting and questioning the children who come to the roadside. The idea is to distract them from their practiced and half-hearted routine. It works about half of the time, or less. They are picking fresh greens which grow wild in the young maize fields. A talkative shop owner offers us pap and eggs upon learning that we are from America. And our campsite, aside yet another school. By morning, our audience awaits. For some reason the GPS track from the Dragon Trax site chooses the tar road to Ha Lejone instead of the nice gravel road along the lake. I inquire locally and am told there are some “rascals” along this road. I can understand, I think, as I did sense some tension on our way to the dam yesterday. I suspect some resentment toward South Africans as a result of the dam. We proceed with curiosity. It proves to be a gorgeous ride on the mountainsides along the lake, and the feeling in each community is quite normal. That is, until a boulder comes tumbling down the mountain from several hundred meters above, sent by some mischievous shepherds. Rascals might be the exact word to describe this kind of behavior. The boulder missed by about ten meters. I heard it a few seconds before it came hurtling onto the road surface behind me. A good shot, I say. The boys send two more rocks downward. I should hope this is an isolated incident. The lake is crossed by several small bridges. We seek shelter from a thunderstorm in a small bottle shop in Ha Lejone. But these kids are tons of fun. Most kids in Lesotho are loads of fun, if you can find the energy for it. We can’t fault them for finding us interesting and wanting attention. We love them, but by the end of the day, we relish the few moments of peace in our tent. Away from Ha Lejone along the lake, we consider two route options. The Dragon Trax route follows a river, away from any roads or trails shown on my basemaps. Locals don’t know anything about the route. It will either be a well traveled footpath that only people in the last few villages use, or it won’t be much of a trail at all. The alternate route is a 4×4 road past the Kaa Diamond mine over a pass to the main tar road, landing somewhere near the AfriSki center on the other side. Now that we are mining country, even the good gravel roads get extremely steep. We climb one last time for the evening and descend to the Motete River for the night. We’ll begin first thing in the morning. Damp roads and a chance of rain invite us in the morning. The road continues for several kilometers, diminishing along the way into a wide footpath tracked only by feet. And then a series of singletracks to the last village. This is where it gets interesting. From here, we follow the Malibamatsu River to the tar road, a distance of almost 20 miles. At first, we find remarkably ridable hillside singletrack. Pick and choose from mostly ridable trail, but with frequent dismounts. The trail becomes less defined, rougher, and less continuous, easily confused with the thousands of sheep trails on the hillside. We continue as near to the track shown on the GPS as possible, which often lands us onto reasonably passable trail. Eventually, the we must cross the river, four times in total, in quick succession. At this point it has been raining slowly for several hours. We wade waist deep through a strong current, about as deep and swift as I am comfortable carrying our bikes. We leave our shoes on, and hoist the bikes mostly out of the water, partly floating them on the surface to reduce the strain and to stabilize ourselves. When crossing the river in the opposite direction to keep the bicycles on our right hand side but not upstream of us, which presents a serious hazard, we point the tires upstream and walk sidestep from bank to bank. These two shepherds try to help Lael find a better place to cross, as I have already carried both bikes across this section which went nearly to my chest. This was the fourth and most challenging ford. There are no villages for many kilometers in either direction. These boys are tending to a flock of sheep for the summer, living in very simple thatch roofed round houses, like slouching squat versions of the nicer roundhouses most Basotho inhabit. These guys were actually really cool, and asked for our phone number to call us later. We informed them that we did not have a phone, which was shocking and hilarious. Eventually, after hours of bushwhacking along infrequently ridable sheep trails, the route regains some definition. The rain leaves us, and the feeling comes back to our fingers and toes. We were at once quite miserable. A lightness returns to the day. To finish the route to the tar road, the trail shortcuts several meanders. A shepherd’s shelter, which often takes a high vantage. Each shelter is spaced just within sight of the next one, usually a km or more away. The last few km are partly ridable, the sun shines, and what once felt like a huge task, is not more than a powerful memory. We immediately point our tires up Moteng Pass and spend the entire climb praising the virtues of tar roads. After many miles of pushing, my Achilles is very tight. The tar is a relief for now. And down, at breakneck speeds down 4000ft. The Dragon Trax route continues north up another roadless river valley to connect near the border. We opt for a casual long-cut on the tar road, to connect with a gravel road along the border. This likely adds over sixty miles, but our bodies enjoy the chance to pedal and dry out. We turn onto gravel for our final day of riding toward Monantsa Pass. The white flag indicates that there is maize beer for sale. Yellow indicates fresh fruit. Green, vegetables. I assist with some roadside bike repair. My Crank Brothers Multi-Tool is a marvel, especially the chain tool. Riding to South Africa, which will be a relief. We take a wrong turn just before the border and climb an extra 1500ft into a wooded meadow. There have been very few trees in all of Lesotho. We camp for the night, and plan to ride across the border in the morning. At least up here we are treated to a peaceful night. It feels like Northern Arizona up here. Donkey wake us in the morning. Descend to the main dirt road. And climb to the border. There are crews of workers lazily tending to road construction matters near the top of the pass. Less than a 100m from the border, one woman demands, “Give me your squeeze bottle!” She is referring to the water bottles on my fork. I look at her, sweating and panting from a steep climb in intense sun. I shake my head no, and push for the border. I love you Lesotho, but I need a break. The descent off the backside of the Drakensburg into South Africa feels like a homecoming. Four boys take chase from the last town, meeting us on the road as they shortcut a series of switchbacks that we work desperately to climb. At each turn, they stop and wait without saying a word. They continue the slow run as we pass, keeping aside or behind by only a few feet. Our route is a rough dirt road turned steep 4×4 track, and will soon become not much more than a loose assortment of footpaths and donkey tracks. At the end of the doubletrack-width road, we scout the route ahead. The eldest boy indicates one track versus another. We continue up. Over a thousand feet higher than where they began, the four boys turn back towards home. One is wearing knee high rubber boots. Another is barefoot. They are not winded. Barely in the first grade, these young men are stoic. Children in Lesotho are like men and women, only smaller. Looking for the route up to the saddle on a goose chase set forth by the pink line on my GPS– one in a series of tracks I casually downloaded from the Dragon Trax website several weeks ago– we push through the boulder field at the end of the road and choose one of many trails into the scrub. Naturally, we follow either the best looking path or the one with the least elevation gain, ascending slowly enough to make me wonder how we will intersect the pass, likely to arrive well below it. Slipping sideways on granular decomposing bedrock, we look upwards. There are a dozen sheep above us along an approximate line on the hillside. Lael thinks there is a better trail. We point the bikes straight up the hill and begin pushing, using the brakes in the manner of an ice axe to hoist ourselves over tufts of brown grass. We drop our bikes along the trail and break for water. Two woman appear from the direction of the last town, carrying small backpacks and large handbags of goods. They walk past without saying anything, barefoot. I am amazed to see them here. If they are surprised by our presence they don’t show it. The trail continues upwards as a pronounced bench cut by hoof and human, punctuated by steep scrambles through boulders worn into trail. Looking back, I imagine that with some skill, this is mostly rideable. We make only a few pedal strokes up to the saddle. At the top, a group of five men and women are seated, sharing two large mugs and one big chicken bone. One mug contains a maize drink, lightly sweetened. The other, which they decline to share with us, is an alcoholic maize home-brew. They indicate through charades that it will make our heads crazy. The chicken bone is offered, which I decline. The sweetened maize drink is nice. Reminds me of a drink the Raramuri prepare in the Copper Canyon, Mexico. Two woman in the group ask for “sweets”. We offer a small bag of raisins in trade for the taste of their drink. Lael unveils the raisins as if a consolation for not having chocolates or candy– which we assume they are referring to– but they are delighted nonetheless. Despite constant exclamations for “sweets!” by the people along the roadside, I haven’t given anything to anyone, at least not since I bought some apples and nik-naks for the young girls that entertained us with a vast repertoire of songs from school. They were adorable, educated, polite– less than five years old, I think– and did not ask for anything. But it was lunch time, and I felt inclined to share something as Lael and I sipped a 1L glass bottle of Stoney. Lael cut up the apples and tore open the bags of puffed maize, instructing them to share with the youngest int he group. They did. Once the formalities are finalized with the woman holding the chicken bone– pointing to the next village and pointing to the last– we say “Dumalang. Thank you.” and roll over the hill. No one in the group is incredulous that we are on top of the mountain with our bicycles. I am. On an adjacent hillside is a small round house with a thatch roof, around which dozens of people have gathered near a smoking fire. Something special must be cooking on that fire– an animal, I assume– and the maize beer must be flowing. The group is loud, making an impression of being no less than a proper party, perhaps more. This is Friday night in Lesotho. Our route continues away from the party, now on a better trail along the hillside which is rideable about half the time, maybe more. We gain some distance on the two barefoot women we met earlier, to lose it at the next short rocky ascent. Coming to another saddle, a group of single-room round houses appear. We arrive just behind the two women, who now laugh loudly. They are tired and happy to be home. I am happy for them, and at least I realize it is amusing that I am here. Several children nearby agree. We continue away from the village on a wider bench lined with cobbles on either side. The track appears to have been a road, or perhaps was planned as a road. It remains for many kilometers as an easily identifiable corridor of footpaths and donkey tracks, all the way to Semonkong, always with rocks piled alongside. Far from the open roads of the karoo, this is still the Dragon’s Spine route. Lesotho, as it should, lends its own character to the route. From Barkly East and Wartrail we cross Lundean’s Nek into a fragment of the former Trankei region, between mountains and the border of Lesotho. Transkei was one of several apartheid-era black homelands, or Bantustans as they were later called. We are still in South Africa, but life is different here. There are no white people, and the home life is based upon subsistence farming, not daily toil for basic wages. The result, as I see it in my brief visit, is not a wealthier life, but quite possibly a richer life. Many criticize the black homelands projects for creating regional ghettos based upon race. I agree upon principle. However, the communities seem strong and people seem more open and energetic with us. The Bantustans were designed to become independent states, forcibly separate from the nation of South Africa. If it sounds like a strange and strong-armed social engineering project, it was. While separate from South Africa, none of the Bantustans were ever recognized by any other nation, a purposefully defeating geopolitical purgatory. Along the Tele River, between the former Transkei and Lesotho. There are people everywhere, absolutely everywhere. While there are several river fords to cross into Lesotho, we continue in South Africa to the official crossing at Tele Bridge. Ooph. Beware with bottles on the fork that they do not dislodge during rough descents. We’ve made velcro straps to secure the bottles, but this still happened. I went straight over the bars. Afternoon thunderstorms are becoming more frequent, although not entirely regular. Often, clouds build for hours and hours. We hide inside a store. Funny guys, tough guys, and nice guys– South Africa is full or characters. Late in the evening, we make friends at the bottle shop. We are led around by the local English teacher to see the farming project in place on his property. I can tell he’d had a few drinks already. We oblige nonetheless. We spend time in the bottle shop with a group of young men. This woman owns the shop. Good conversations cannot be taken lightly, and we talk for hours. We take a tour around town. Many young people out walking in the evening. For the night, we stay inside a fenced property adjacent to the bottle shop. By morning, we ride into Lesotho. Free condoms in the toilet. Lesotho has the third highest rate of HIV/AIDS in the world. Lesotho. South Africa is across the river. We connect to the tar road at Alwynskop for several miles to meet a dirt road toward Phamong. We’ve been told about the condition of the roads in Lesotho. So far, so good. There are many signs indicating projects funded by the USA, EU, and other wealthier nations. We stop to avoid the sun for some time. Immediately, people move in our direction, toward our bikes, toward us. This young girl recites a school lesson, “I am a girl. I am five years old. I live in a city. My name is…”. The group joins for a shoot. Followed by an impromptu performance of song and dance. The first song is in English, “Early to rise, early to bed…”, while the remaining are in Sesotho. A half hour later I share apples and maize puffs, partly to save these girls from themselves. They are slowly losing steam near the end of the performance. Day one in Lesotho features incredible roads. But we’re still waiting for the kinds of roads that make this country (in)famous. Everyone has a voice, and everyone uses it. I’ve never waved so many times in one day. Another stop. Michael Jackson comes bumping out of this shop. Curious, I enter and buy some maize puffs and a beer. The stereo is operated by the small solar panel outdoors. The rest of the playlist is comprised of African tunes. We’re starved of music, and spend some time in the shade listening. As Lael boils eggs over a beer can stove on the ground outside, an audience surrounds. Even I recognize how unusual we are, especially Lael. Just as our audience peaks, she often feels the need to fit in her six minute jump roping routine. The stone-faced group is quickly cajoled into shouts and smiles. We’re headed to the village of Bethel, where we’ve ben told we can find a Canadian man. No more was told about him, but I am curious. In Phamong, I ask directions to the Canadian. “His name is Mr. Ivan,” I am told. We find Mr. Ivan and his home, his school, his gardens, and his solar projects. He is a former Peace Corps volunteer who settled in Bethel many years ago, and has been growing his positive influence through education and employment. He’s an eccentric obsessed with solar energy, permaculture, and education. He is exactly what people in this country need. He’s also Ukrainian, via Saskatchewan. It is not until he says “as common as borsch” in conversation that we make the connection. The phrase has now entered my vocabulary. Our route after Bethel promises to be more adventurous. We will follow the serpentine line into the mountains, and will stay high on dotted lines until descending into Semonkong. Climbing from Bethel toward Ketane. Shops are stocked with maize, maize puffs, vegetable oil, soaps, matches, candles. Cookies, cold drink, and beers are sometimes available. Methylated spirits and paraffin are also common. The official currency of Lesotho are maluti, which are price fixed against the South African rand, which are also accepted everywhere. Leaving Ketane, toward the end of the road. These are the boys who steadily chase us uphill. The end of the road, and the beginning of our adventure into the mountains. The boys return home. Just a couple of “peak baggers” in Lesotho, coming home from market. Party house. Friday night in Lesotho! Every inch of rideable trail is worth the effort. To share the same footpath as thousands of people over many decades is powerful. The outline of a road guides us beyond the first village. By morning– in fact, before sunrise– a man calls out loudly in front of our tent. “Morning!”. I hear his voice, unzip the fly, and peer outside with sleepy eyes. He is beaming, wearing a smile. We exchange greetings in English and Sesotho, and I lay back to sleep. He just couldn’t help himself. We made our presence known in the evening to ask for a place to camp. There is plentiful open space here, but people are so curious it is best to introduce yourself. I most villages, it is recommended to ask the chief for permission to camp. Our tent rests between towns for the night. The idea of a road continues, village to village. There are no vehicles, no corrugated metal, and no outhouses this far out. Eventually, these features return one by one as we near the other end, near Semonkong. Outhouses and corrugated roofing reappear, indicating our proximity to town. Finally, we encounter a group of students who have been hired to register voters for the upcoming elections. We make friends with many high school aged youth. They speak English and are more connected to urban styles and global perspectives. Cell phones are ubiquitous. New styles for the 2015 spring bikepacking season. A photo shoot ensues with both of our bikes and helmets. At last, the road becomes passable by 4×4., but this last climb has us pushing. From the end of the road near Ketane to the beginning of the road near Semonkong, I estimate that about 50-60% of the route is ridable. Through this section we are on and off the bike frequently, although the connection this route makes is worthwhile. We join the flow of people to and from town. It is Saturday, and many people are returning from market with 50kg bags of maize meal, large bags of maize puffs, and other necessities and delicacies. It is amazing the things woman can carry on their heads. Maletsunyane Falls, the tallest falls in all of Lesotho. Finally, while a high quality gravel road continues toward town, the local people straight-line over hills to shorten the distance. Our GPS track follows. Who cares about singletrack when you have six to choose from? And out of town as fast as we can. The town is deflated after a busy market day. This is our first city in Lesotho, barely more than a few thousand people, and we don’t find much reason to linger. We’re meant to be in the mountains, I realize. The next segment promises similar adventure, as the GPS does not indicate a road for some of the distance. Donkey track, forgotten 4×4 road? Certainly, we’ll find footprints. There are people everywhere. For the love of dirt, and Albania. If there is a way to slow the clock, riding in the mountains off-pavement is it. Dirt brings us back a decade or more, and slows our progress out of the country. Progress is much less the goal anymore. We ride through the beautiful city of Korça, and into the hills for a day. The route of officially unconnected roads doesn’t work out due to impending rain. Return to pavement after a whole day of pedaling, less then a dozen miles south of where we left it the evening before. And then, off towards Greece. Dirt, road, bikes. Rock ‘n Road. Dirt roads are much the way they sound– they are roads composed of local sediments, sometimes groomed and graded and maintained, sometimes abandoned and rugged. But the variety of dirt roads is greater than the variety of paved routes, which partly explains the great variety of bikes in use for these kinds of rides. Still, the emergent genre of dirt road riding is finally landing on some common themes– not quite standards– but commonalities in tire size and tread, handlebar concepts, and in some cases, luggage. Of course, riding on unpaved roads is ancient as far as bicycles are concerned. But today, greater accommodation of comfort and efficiency on unpaved surfaces is afforded through new equipment. Specifically, a vast array of lightweight large-volume 700c/29″ tires are perfectly tuned for dirt, road, riding. 26×1.95″ Specialized Ground Control tires, WTB Roller Cam brakes, and WTB Dirt Drop bars. One of only two 26″ wheeled bikes in this collection, back when large-volume 700c tires were unavailable. Several years earlier, a few Marin builders had gotten their hands on some 700x47mm Nokian Hakkepelita tires for use off-pavement, although supply issues forced the concept out of existence. A year after this Potts frame was built, Bruce Gordon released his 43mm Rock ‘n Road tire. This bike would have been considered a true mountain bike at the time, but has since informed the kinds of bikes that are popularly ridden on dirt roads, such as the Salsa Fargo. Marin County is home to many historic fire roads. 700cx43mm Bruce Gordon Rock ‘n Road tires, and custom Bruce Gordon cantilever brakes. This design and the accompanying tire celebrates 25 years in existence. Continental RaceKing tires, Shimano CX-75 brakes and vintage WTB Dirt Drop bars. Check out this thorough post on the Super Scrambler. 650B Schwalbe Rocket Ron tires, Avid BB7 brakes. Fits large volume 650b tires or cross-type 700c tires. Kenda Happy Medium tire, Paul Racer brakes, dynamo lighting and mini-rack. This is the narrowest tire of the bunch, but represents what many people consider to be an appropriate tire for unpaved surfaces. This size is fine for graded, hardpacked surfaces without a load. 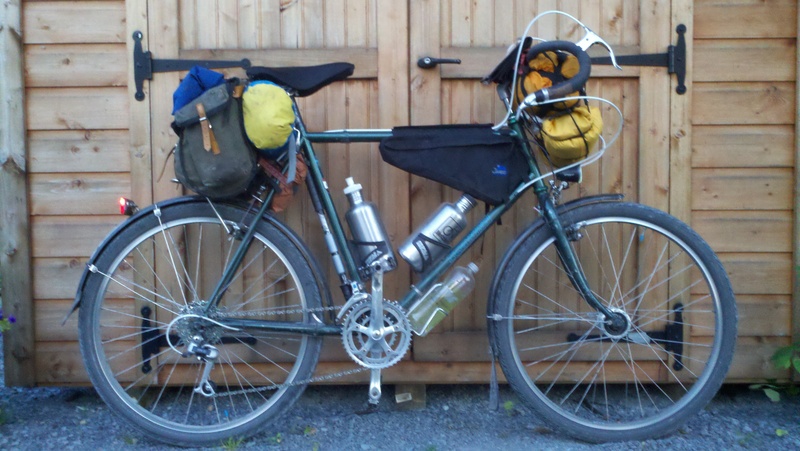 26″ Schwalbe Marathon Supreme tires, Paul Touring cantilever brakes, dynamo lighting, and expedition-grade racks. In this instance, 26″ wheels are selected for durability and the ability to source wheels parts all over the globe. Credit to Bruce Gordon for pushing the first large volume 700c tire through to the American market, and building a bike to fit it. And to the 700x45mm Panaracer Fire Cross XC. Credit to mountain bikes and all-terrain bikes and down-home dirt roads everywhere, and the people who ride them. Credit to the Surly LHT which is a “real touring bike”, but fits bigger tires and is a gateway bike to dirt roads for many; and the Cross-Check, the monstercross bike of the people; and the Salsa Fargo, which has reintroduced the idea of knobby tires and drop bars to a lot of people. Surely, credit is also due elsewhere: Grant Peterson and Rivendell (and the drop-bar Bridgestone MB-1), cross bikes, Jan Heine and ultra-plush 650b tires, Charlie Cunningham and the WTB drop bar, Wes Williams, Chris Skogen, Mike Varley and the Black Mountain Cycles Cross frame; Divide racers, gravel grinders, Hemistour riders, the BLM, and the most prolific builder of dirt roads in the world, the United States Forest Service. Bruce Gordon’s influence is immeasurable. If you ask Bruce, he started it all. Note: the BG Rock ‘n Road tire was actually designed by Joe Murray, and borrowed heavily from the Nokian Hakkapelita. Does your bike happily ride on dirt roads? rough dirt roads?